Can I Restrict My Meeting Capacity? A large meeting license allows up to 500 or 1000 participants, depending on license, to attend a Zoom meeting. 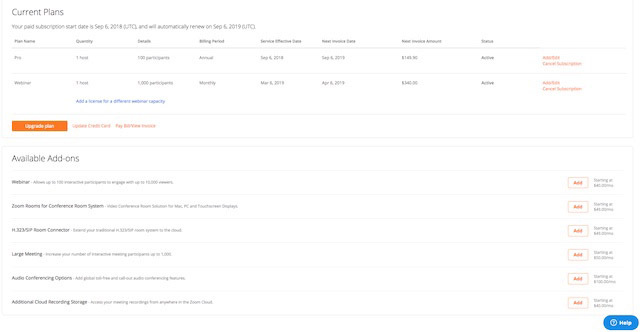 The owner or the admin of the account can add this feature for users with Pro licenses and it can be subscribed to on a monthly or annual basis. Note: Basic users cannot be assigned the Large Meeting add-on. Log into your Zoom account and navigate to Billing. 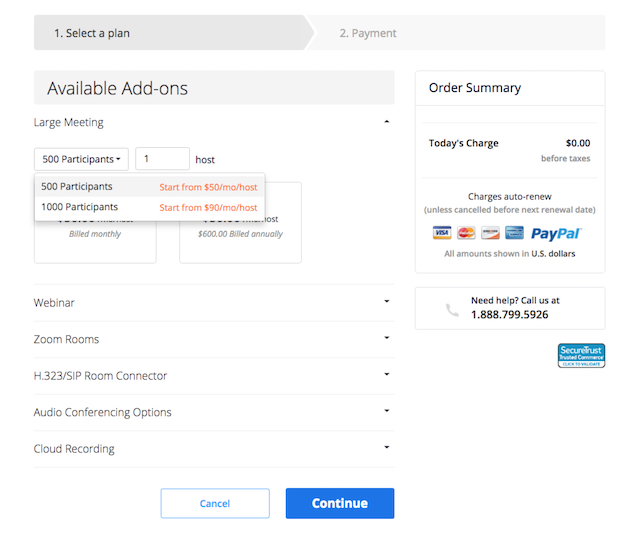 On the Current Plans tab, scroll to Available Add-ons and click Add next to Large Meeting. Choose the capacity of Large Meeting add-on, monthly or annual payments, and the number of licenses you need for your account. Review the changes. If correct, click Upgrade Now. Login to your Zoom web portal and navigate to your Users Page. Locate or search for the user who you want to assign a license to. Click Edit next to their name. This will open a window where you can select the license you would like to assign. Choose the radio button for the size of the license, if it is not automatically selected. The license is now applied to the user and they can use it immediately. In active speaker mode, you can scroll left or right to see all participants. Learn more about Active Speaker. In gallery view, you can see up to 49 video participants per page. Learn more about gallery view.